Donald Trump dreamt of entering politics in reaction to the events of 9/11, the official version of which he challenged. It is only after his meeting with Steve Bannon that he decided to stand for US President. He made Steve his campaign director and once elected, his special adviser. Forced by members of Congress to sack him, he supports him on the sly to take control of the Republic Party. 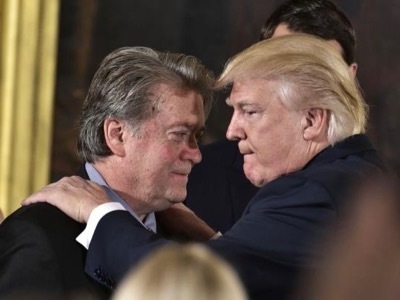 The two men intend to make the United States a Republic again. From an outsider’s perspective, we observe that behind his sweeping declarations, Donald Trump is discretely continuing with his action against Daesh. He has squeezed the Islamic State dry and has recovered its capital. He has transformed Nato so that this organization too is anti-jihadist. For the moment, we don’t know whether, once Daesh has been destroyed, President Trump will continue to fight against other jihadi groups. Nor either do we know how he will react to initiatives taken by the Pentagon to obliterate state structures of the North West of Latin America and South East Asia. He still has a long path to tread to make the decadent Empire a Republic which it really never became……..